This last week in Malin Head i decided to try some different photos to the ones i normally take up there. This photo shows Peter lighting up the actor of SS Justicia, showing the vast size of her. Most of the photos to follow were taken using the video lights 9000F Video Light from Nautilus. On 19 July 1918 Justicia sailed unladen from Belfast to New York escorted by destroyers. While 23 miles south of Skerryvore, Scotland, she was torpedoed by the German Type III Coastal U-boat UB-64, under the command of Otto von Schrader. Justicia took on a list but the watertight doors were closed in time, temporarily preventing her from sinking. UB-64 then fired two more torpedoes at Justicia, striking her side. A fourth torpedo struck the wounded Justicia but she still remained afloat. The escorts were able to damage UB-64, which departed the area, while radioing in Justicia's position. Most of the crew were evacuated, leaving only a small number on board. Justicia's engines were still operable and the tug Sonia took her in tow, in an attempt to beach the stricken ship at a suitable location near Lough Swilly. The following day, UB-124 found Justicia and fired two more torpedoes just after 9:00 am, which struck her amidships. By noon the remaining crew had been evacuated and the vessel rolled onto her starboard side and sank. 16 crew members were killed. In total, Justicia had been hit by six torpedoes. The destroyers HMS Marne, Milbrook, and Pigeon attacked with depth charges and sank UB-124 with gunfire after she surfaced. 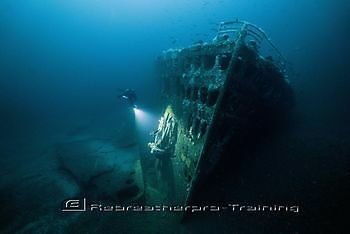 Today, the wreck of Justicia lies 28 mi (45 km) north-west of Malin Head, Ireland in waters 68 metres deep.